The second stand-alone side-story in the Star Wars franchise since Disney took over stewardship, Solo: A Star Wars Story tells the story of a young Han Solo (played by Alden Ehrenreich), before he becomes the established, swashbuckling pilot we first see in Star Wars: A New Hope. 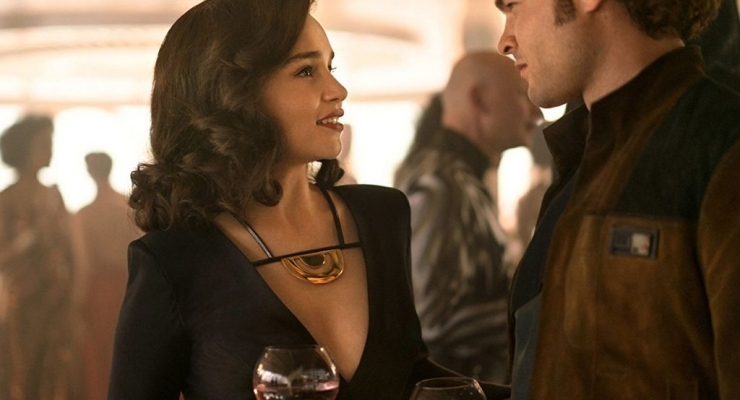 The story takes place years before the rebellion where Han, not yet a pilot, goes on an adventure into the criminal underworld to save his childhood sweetheart and femme fatale Qi’ra (Emilia Clarke, Game of Thrones), meets his best friend Chewbacca (Joonas Suotamo), and crosses paths with Lando Calrissian (Donald Glover). The film took a lot of flak for being a failure as far as Star Wars films go, failing to reap the big numbers at the box office of previous films in the series, but given the timing of its release coming up against Avengers: Infinity War, only three months after Black Panther, and only five months after Star Wars: The Last Jedi, and how it still managed to take a profit with its worldwide gross of nearly $400 million, I’d say that criticism is way overblown. Solo: A Star Wars Story is not the strongest film in the franchise, but it also not as bad as some would have you believe. The film is energetic and filled with enough of the Star Wars tropes to satisfy longtime fans. Somethings do feel a little purposely pigeonholed in, such as a scene that finds Han crossing paths with the seeds of the rebellion, but on Howard keeps things moving along so quickly we don’t have time to worry about the minor decencies. And Alden Ehrenreich is a perfectly charismatic young Han Solo with Emilia Clarke an enticingly duplicitous foil. This is a fun entry in this long running franchise. Solo: A Star Wars Story was shot on the Arri Alexa 65 with Arri Rental Prime DNA lenses, Arri Alexa Mini, and Arri Alexa XT Plus with CamTec Falcon Full Frame lenses at 3.4K and 6.5K. It was mastered with a 4K DI with Dolby Vision HDR and arrives on 4K Ultra HD Blu-ray in a 2.39:1 framed HEVC 2160p (4K) encodement with HDR10 HDR that has maximum nits of 1000 and minimum of 0.0001. The image is flawless. Given the desaturated look of the film, there’s still a lot of ‘pop’ present thanks to the HDR10’s Wide Color Gamut and dynamic range. The highlights really leap from the screen, so explosions and the famous Star Wars laserguns standout. The shadows are exceptionally nuanced and clean. 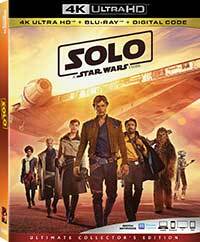 Solo: A Star Wars Story comes to 4K Ultra HD from Disney with an immersive English Dolby Atmos audio mix. While this isn’t the worst of the recent Disney mixes I have heard, there is still something that sounds constrained about this mix, with the dynamic range a bit narrow, and the overhead channels don’t bring much to the game here. On the positive side, the mix’s dialogue and sound effects are clear and the low end is deep without becoming unruly. This set comes an excellent set of special features that includes plenty of interviews with the cast and “making of” featurettes breaking down much of the various scenes and special effects from the film. Solo: The Director & Cast Roundtable (1.78:1; 1080p/24; 00:21:44) – A friendly roundtable discussion led by director Ron Howard. Kasdan on Kasdan (2.35:1; 1080p/24; 00:07:50) –Larry Kasdan & son Jonathan Kasdan have a discussion on working together to write Solo. Solo: A Star Wars Story is a fun ride with lots of energy and fantastic visual effects – just what you want in a Star Wars movie. Was anyone clamoring for a backstory about Han Solo? Probably not, but it is cool to see what made the roguish hero into the Han we all know and love. This 4K Ultra HD release looks flawless and comes packed with special features. Years before the rebellion, a young Han Solo (Alden Ehrenreich) meets and befriends his faithful co-pilot Chewbacca and comes across fellow rogue Lando Calrissian (Donald Glover) while delving into the seedy criminal underworld. Despite its widely known production woes, Solo: A Star Wars Story is a Star Wars spin-off that delivers Han Solo's backstory and never fails to entertain with a pulse-pounding plot, great 'droids, and a young A-list cast that entertains and diverts. This 4K Ultra HD Combo Pack release also delivers the goods with a reference HD picture and feature-rich bonus Blu-ray disc.